Ken Roberts writes in about his visit to Scanuppia. Before getting on to his comments see my entry here from 2007. "Steepest, hardest, long climb I've ever attempted. The steepest hardest long climb on a sealed-surface road in Europe (or the world) -- at least I've not yet heard any serious proposal for any sealed-surface road that comes close. I did not succeeding in climbing it -- gave up before I made it even halfway thru the 24% (or steeper?) section. So I actually don't know what's beyond that. I did measure the sustained 24% section I rode with my GPS with barometric altimeter (with auto-calibration turned off). 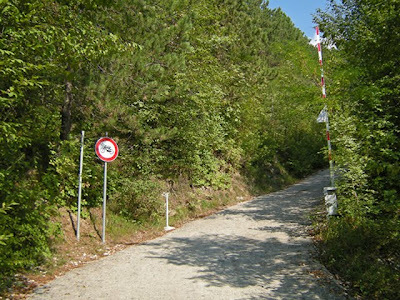 -around 24% for about +375 meters in lower section of narrow concrete road. -around 14% for about +135 meters. -? perhaps further climbing on dirt-gravel after the concrete surface ends ? Limited use? 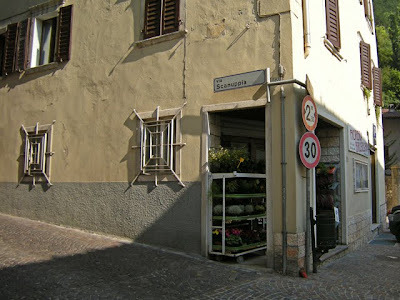 I don't know anything about laws and road usage customs in Italy, but I saw a sign by start of the narrower concrete road which might have suggested that using the road is not permitted for non-local residents . . . I saw another sign on the wider asphalt approach road below the start of narrow concrete, which might have indicated that it was private -- I saw some kind processing plant by the start of the narrow concrete section. On the other hand when I was there on my bicycle, some guy at the processing plant came out to help point me the right way when he saw I had missed finding the start of the narrow concrete road. And two cars passed me while I was riding on the narrow concrete road and didn't try to say anything to me. 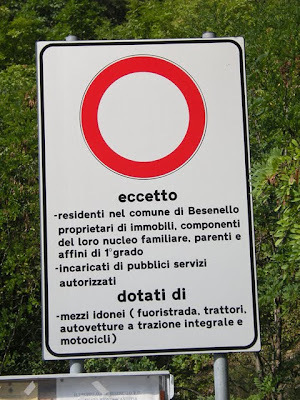 So if you're not sure about how that applies to you, I suggest you check with some authority before you take the time and effort to travel to Besenello. Another way: start in the town of Besenello [ see on map ] which is a ways south from the major city of Trento in northeast Italy. 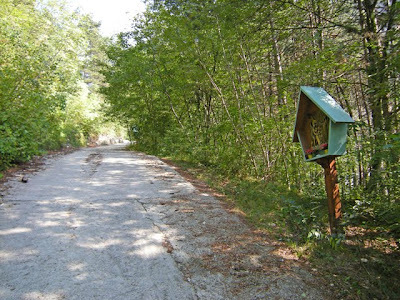 Find the street Via Scanuppia (starts narrow brick, later changes to asphalt) and start riding up roughly northeast for about 400 meters until it meets another road. Bear Right to join the other road and climb roughly east. When get near a processing plant, turn Left onto a narrow asphalt road north over a short bridge - (do not keep climbing up that nice wide asphalt road). Just after the bridge the asphalt ends and the narrow road climbs moderately with the first two shrines along the right side. Soon sharp curve right (east) and there's a gate and then you're riding on 24% steep narrow concrete (soon a third shrine on right). I interpreted the round sign next to the gate to mean "No mopeds or electric bikes" - (but I don't know much about laws and road customs in Italy). It's even harder . . . What makes it even more difficult is that much of the concrete surface is not "even". Not that it's "rough" (though in a few spots it is that) -- but that it's "wavy", like with very wide "ripples" in its surface. I suspect the this unevenness is intended to provide better traction when there is snow or ice. So using super-low gearing doesn't solve everything, because you have to maintain enough momentum to carry thru the low zone between "waves" (which might also have some erosion on it). Scanuppia is not just about muscular endurance, also balance and reacting to changes. Could get hurt . . .Stories I've read about people trying to ride up Scanuppia tend to include the number of times they fell off their bike. The main thing that made me give up was that as my legs got more tired I was more afraid I was going to fall. Therefore . . . Practice getting out your feet out of the pedals quickly. Have a plan for who you're going to fall onto a hard concrete surface without getting hurt. (And if you plan to continue, how you're going to get started pedaling again on such a steep slope). Also how to get back down again. 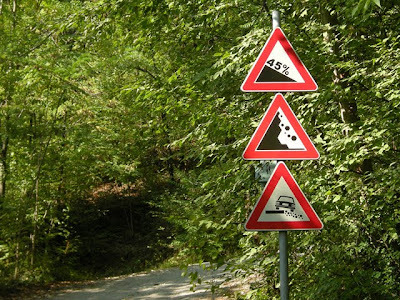 Good to practice in advance how to handle very steep slopes without going over the handlebars -- including the possible need to make a sudden stop on descent because of sudden appearance of an animal or uncoming car. And if it rains or snows, getting down could get dangerous." Stories, including cycling trip stories, for the Italian Cycling Journal welcome; contact veronaman@gmail.com. See here for a chance to win a T-shirt for submitting a story. Story by Deirdre Pirro which appeared in THE FLORENTINE. A game-shooting safari at Ouagadougou in Upper Volta (today Burkina Faso) proved fatal for Fausto Coppi, one of Italy's greatest and most idolized cyclists who, in the 1940s and 50s, was acclaimed by his fans as the Campionissimo or the Hero. When he returned to Italy just before Christmas 1959, after taking part in celebrations for the independence of that African nation with other Italian and French cyclists, he had a fever that he thought was a simple influenza. His doctors thought likewise. Coppi had malaria from which he died, just over 40 years old, on January 2, 1960. The French rider, Raphaël Géminiani, who shared a room with Coppi during the trip also came down with the same symptoms, but, treated in time with quinine, he survived. Born Angelo Fausto Coppi in Castellania, a small rural village not far from Tortona in Liguria on September 15, 1919, he was one of five children. As a young man, while working as a butcher's delivery boy in Novi Ligure, he met the famous blind masseur, Biagio Cavanna, known as the ‘magician of Novi' or the ‘blind clairvoyant' of cycling who, as his trainer, would mould his future career. In July 1937, Coppi took part in his first road race on the local Boffalora circuit and, the following year, won his first event at Castelletto d'Orba. Wearing his famous white and sky-blue jersey, he was equally talented as a long-distance rider, sprinter and climber. He won 138 races on the road (118 as a professional), including the Giro d'Italia a record five times (1940, 1947, 1949, 1952 and 1953); the Tour de France twice (1949 and 1952); the Giro di Lombardia, a record five times (1946, 1947, 1948, 1949 and 1954); the Milano Sanremo (1946, 1948 and 1949); and 84 out of 95 track pursuit races. Physically, Coppi was the antithesis of the athlete, although his unusually slow heart beat of 30 to 40 times per minute-about half the normal rate of 70-amplified his stamina. A tall, skinny man with a delicate frame and hooked nose, he was fastidious about his diet and exigent about his equipment. A reserved person, he talked little and smiled rarely. Italy, which at the time of Coppi's greatest successes was struggling to recover after the cataclysm of World War II, was badly in need of optimism and a new beginning. The Italians venerated him. Their adoration was further fuelled by his legendary rivalry with Gino Bartali, the champion from Ponte a Ema, near Florence, almost his complete opposite in every respect, even down to their religious and political views: Coppi, an atheist, represented the Communist Party while Bartali embodied catholic Christian Democrat ideals. What the press and his fans could not pardon was that their ‘divinity' had clay feet. Coppi, a married man, made the unpardonable error of falling in love with a beautiful married woman and mother of two small children whom she would leave for him. In 1948, during the Three Valleys of Varese race, Coppi met Giulia Occhini, the wife of one of his most enthusiastic fans and a local doctor, Enrico Locatelli. In 1953, when Occhini, wearing a while duffle coat, was spotted waiting for Coppi at the finish line of the race that crowned him road-racing champion of the world, a French journalist from L'Équipe revealed her presence, calling her ‘la dame en blanche' (the lady in white). In the bigoted 50s, the scandal caused by their relationship was huge, even provoking the Vatican to openly condemn the couple. The tabloids could not get enough of it, falsely painting Occhini as vain, grasping and some kind of a witch who had ruined Coppi's life and career. 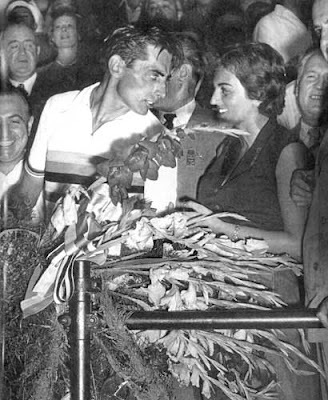 In 1954, Coppi consensually separated from Bruna Ciampolini, his wife and mother of his daughter. Locatelli, however, refused to accept the situation and denounced his wife for adultery, then a criminal offence. Occhini was arrested, kept in prison for four days and then forced, while awaiting trail, to reside in Ancona while Coppi's passport was confiscated. At the end of the court case in 1955, Coppi was sentenced to two months in jail while Occhini was given a three-month sentence (both later suspended). The couple finally married in Mexico, yet the marriage was never recognised in Italy. Their only son, Angelo Fausto Maurizio Coppi, known as Faustino, was born in Buenos Aires on May 13, 1955. Not yet satisfied, Locatelli who was considered the father of the child under Italian law at the time refused, for many years, to repudiate paternity. Then, just when some serenity appeared to have entered their lives, Coppi died, leaving Occhini to bring up their five-year old son alone. Never spared by destiny, at 69, she was seriously injured in a car crash and died on January 6, 1993, after spending 510 days in a coma. 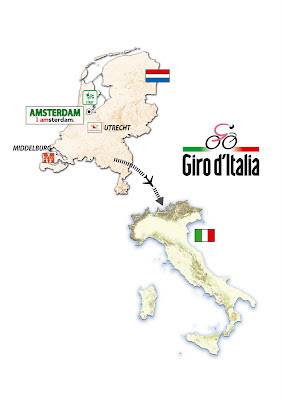 The Giro d'Italia will be starting in Amsterdam for the 2010 edition. A series of "GiroMania" events are being planned for the three days the Giro will be raced in the Netherlands and are expected to attract 500,000 visitors. This is the race program planned for the start: The first stage will be an individual time trial on Saturday, May 8, 2010 starting and finishing at the Museum Square (see map). The second stage on Sunday, May 9, 2010, will begin at the Museum Square and finish in Utrecht. 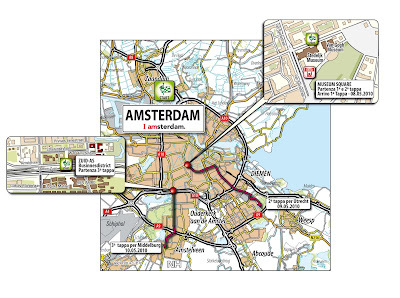 The third stage, on Monday, May 10, 2010, will begin in Middelburg and finish in Amsterdam in the Zuidas district. 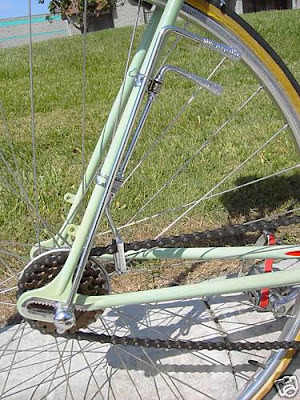 There is a discussion on the Classic Rendezvous discussion list about the use of mountain bike forks at Paris-Roubaix in the 1990s. I asked Eros Poli to tell me about his experience of riding a RockShox equipped Eddy Merckx in P-R. 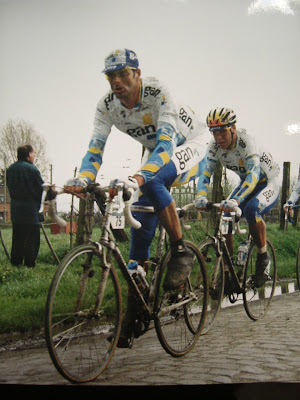 He replied: "We used the RockShox because it served to damp the vibrations on the pavè, on the smooth road portions we closed it to zero and it became rigid. It was much too heavy and did not give great advantages. 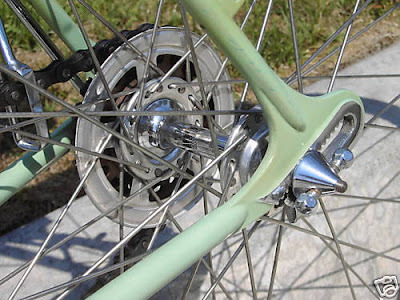 They were replaced with forks with more inclination to the front (ed. note: more rake) which damped and tracked better, they also responded better to attacks on the pavè or from a curve." 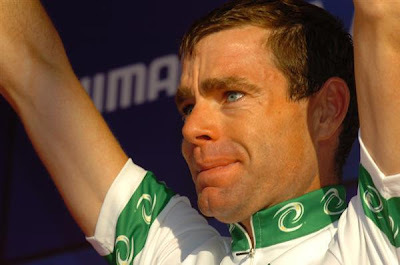 Australian Cadel Evans attacked and took off in the last climb and crossed the Mendrisio finish line alone, ahead of Russia's Aleksandr Kolobnev and Spain's Joaquín Rodríguez. 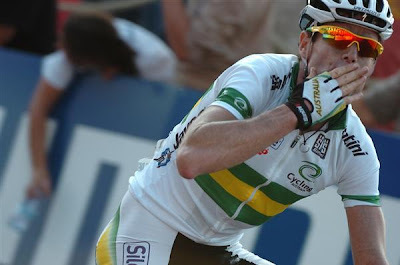 As he crossed the finish line after almost seven hours he blew a kiss to the fans, to his friends and to his people; Cadel lives in Stabio which is a hop, a skip and a jump from Mendrisio. He gave a more intense kiss to the wedding band that hung from his neck and had tears on the podium wearing the champion's jersey. Evans, 32 years old, is the first Australian cyclist to win the World Championships in 82 years of history of the sport and 76 championships. He attacked in the flats before the Novazzano climb with just five kilometres to go in the race. No other cyclist of the eight that were in the lead group—one of them Cunego—could match the Australian's intensity. 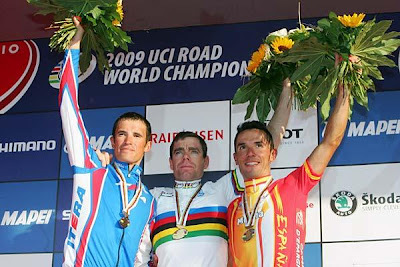 Evans, who developed as a cyclist in Italy, first at Saeco and then at Giorgio Squinzi's Mapei under Roberto Damiani and Aldo Sassi, crossed the finish line 27 seconds ahead of Russia's Aleksander Kolobnev, who had won the silver medal in 2007 in Stuttgart behind Bettini, and of Spain's Joaquín Rodríguez. Sánchez came in fourth 30 seconds behind the winner and Damiano Cunego trailed by 53 seconds in eighth place. "This race was in my home turf," said a very moved and teary-eyed Evans. "This jersey is a great motivator for the 2010 World Championship that will take place in Geelong, Australia, my home town. The win was a response to the criticism that I've been under in recent years because I wasn't winning. However, I have seven medals at home, all of them from mountain bike World Championships, even if none of them is a gold medal. Today is a response to all my results." Especially, in the Tour de France, where he finished second behind Alberto Contador in 2007 and Carlos Sastre in 2008; a week ago, he was defeated in the Vuelta by Alejandro Valverde after a tire puncture in the Sierra Nevada stage, where he lost 1 minute and 15 seconds. Ballerini's Italy missed their chance to go for an unprecedented fourth consecutive victory in a race that unfolded at a normal pace and without any upsets except for the last two laps. They were especially missing those men who should have tried to stretch out the group in the last lap, like Ivan Basso and Pippo Pozzato. Cunego was left alone to face the attacks of a strong Cancellara, both at the Acquafresca climb and in the descent, although the Verona native did not have the legs to respond to his opponents towards the end of the race, even if he was praiseworthy because of his determination. "You can't always win," he commented. 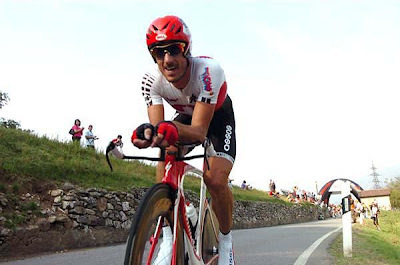 Fabian Cancellara, who was hoping to become the first rider to win both the TT and Road championships, attacked on the penultimate lap on the descent of the Acquafresca. He was was a key protagonist over the crucial final two laps, though he eventually missed out, crossing the line a disconsolate fifth and bursting into tears immediately after the finish line, slumped next to billboards. Italy's Tatiana Guderzo is the new Women's Road Race world champion, and Noemi Cantele added a bronze medal to her TT silver medal. 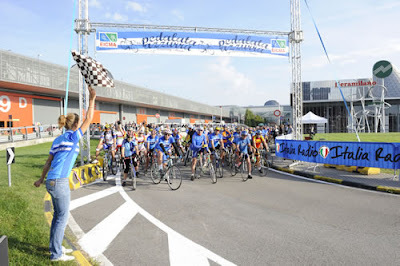 In a race that confirmed the difficulty of the course, a short 13.8-kilometre circuit that was repeated nine times and had two climbs, the Azzurrra team proved to be the strongest and was able to dominate the race. Bronzini and Baccaille worked very well during the first part of the race, then Tamanini and Luperini increased the tempo during the second part. With three laps remaining Cantele attacked on a climb and completed a lap on her own which forced key rivals the U.S. and Netherlands' Vos to chase. On the the last climb of dell'Acquafresca, Guderzo attacked and escaped along with Vos, Armstrong and Cantele. On the descent Guderzo attacked again, gained fifty yards and was able hold her lead up the Novazzano climb and endured to the finish for a solo victory. Cantele, Vos, and Armstrong fought a sprint finish for the remaining podium spots with Vos taking silver and Cantele bronze. 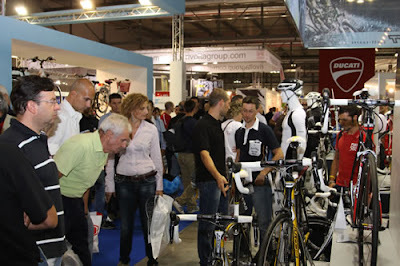 Paolo Bettini was at EXPOBICI where he announced he would be participating in the Gran Fondo Colnago-San Diego on March 7, 2010. Bettini, who is now associated with Briko and unveiled the new jersey for the event, said he could not wait to take part in his American adventure. 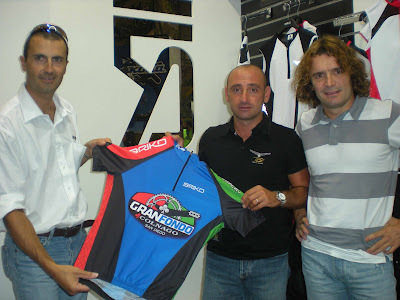 Photo: (l-r) Briko President Carlo Boroli, Paolo Bettini, and Matteo Gerevini, the co-founder of Gran Fondo USA Llc. ICJ reader "Powerful Pete" left a comment yesterday in response to the Centurion Cycling announcement of three gran fondo events that planned for 2010. 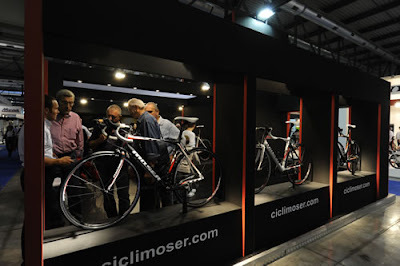 Powerful Pete wrote, "I am very curious to see if these catch on the way gran fondos do here in Italy." It will be interesting to see if it catches on. In Italy it would be difficult, if not impossible, to find a weekend in which a gran fondo is not already scheduled. There are magazines, such as GRANFONDO, dedicated to this type of racing. 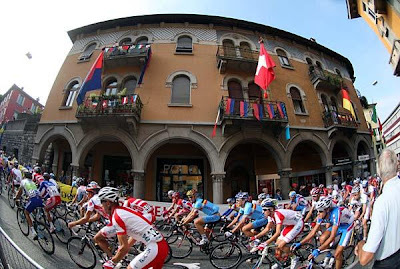 The organizers of the Granfondo Colnago have hinted at a possible 3rd event in 2010. The Univest Cyclosportif (cyclosportif is the French name for the same type of race) would be the oldest event having already had two editions. 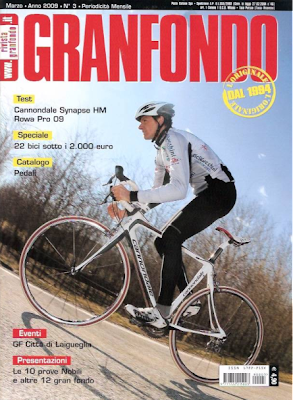 Photo: cover of GRANFONDO; search within the blog using the search feature to the right to find more stories about gran fondos. 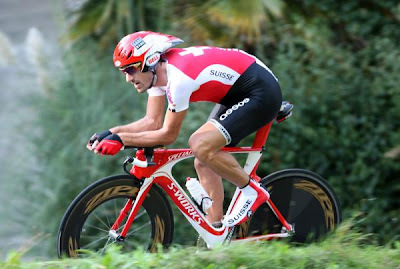 Fabian Cancellara annihilated the field on his way to his third World Championship. Finishing in one minute, 27 seconds, which could have been as much as 1:45 had he not sat up before the line, Cancellara covered the 49.8 Km course in 0:57:55.74 (51.580 km/h average speed). Cancellara will not celebrate his time trial title until after Sunday's road race. And he is hoping for a double celebration. "Last year I prepared well for Beijing, but I didn't have the confidence for the road race [in which he nonetheless won a bronze medal]," said Cancellara. "This year I am confident; I have the mental strength. My legs are ready but so is my head." Second was Gustav Larsson (Sweden), followed by Tony Martin (Germany). Puttin in impressive performances were 4th and 5th placed Tim Zirbel (USA) and Marco Pinotti (Italy). September 24, 2009- VeloFondo has joined with North America Sports to create "Centurion Cycling", a series of granfondo events in the U.S.A. beginning in 2010. The first three granfondos are scheduled for July, 2010, in Boulder, Colorado; August, 2010 in Madison, Wisconsin; and September, 2010 in Mammoth Lakes, California. "Centurion Cycling is North America’s most exciting, new bike adventure. It’s based on the European concept of gran fondos but with a distinctive twist unique to this side of the Atlantic. In Europe, you can ride a gran fondo almost every weekend from March through September. They come in all shapes and sizes and attract riders of all abilities. 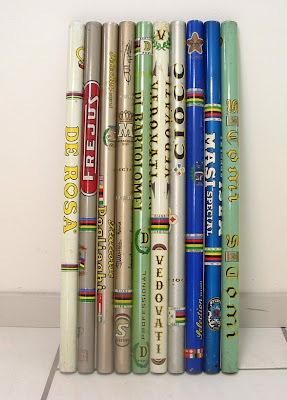 Often, they are named for celebrated cyclists such as Gran Fondo Eddy Merckx, in Belgium, or for famous courses like the Nove Colli, or “nine hills”, in Italy. 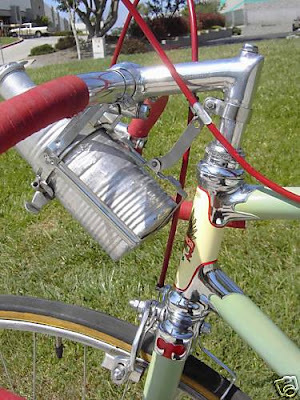 Each Centurion has the look and feel of a European gran fondo. Traffic is restricted, technical and medical support are in the caravan, officials time and judge the event, food is excellent, and riders are treated like professional cyclists. The experience feels like riding in the Tour de France for a day. What makes the Centurion Cycling brand revolutionary? We take the best of Europe’s storied gran fondos and add our own distinctive highlights. Centurion course distances are set at 100, 50 and 25 miles, challenging riders to develop time goals as runners do with marathons and half marathons. At the end of the season-long series, athletes who qualify compete in a championship event. Courses are difficult – designed to appeal to the serious, competitive, recreational cyclist. However, our seeding process and a broad range of age and award categories encourage families and riders of all abilities to embrace the challenge. When course and closure conditions permit, we even add a time trial to appeal to individual athletic performers. The Centurion Cycling series is contested over the most beautiful cycling terrain North America has to offer. Each course highlights the unique cycling in and around the host venue." 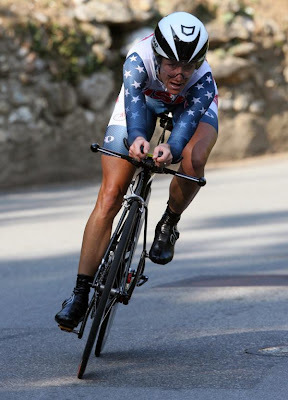 Olympic Champion Kristin Armstrong (USA) won her second time trial World Championship gold medal on Wednesday in Mendrisio, Switzerland. She rode the 26.8-kilometre course in a time of 35:26. 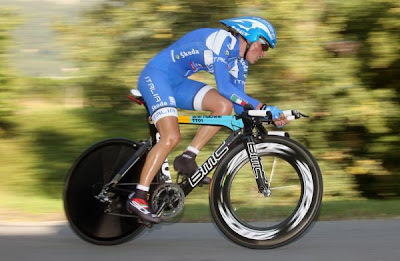 Noemi Cantele (Italy), Italian national champion in the time trial, placed second with a time of 36:21, 55 seconds behind Armstrong, a result unexpected and extraordinary in her first World's time trial. 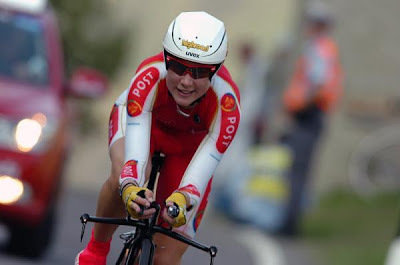 Linda Melanie Villumsen (Denmark) rounded out the women's podium in third, 58 seconds behind Armstrong. 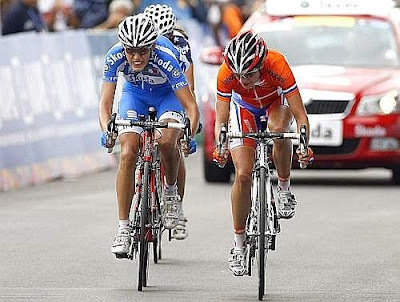 At the first timing point, after 6 km, Cantele was fourth at 22 seconds behind Kristin Armstrong. Then second in the next two intermediate timing points behind Armstrong. At the finish a silver medal. This is only the second time that Italy has won a medal in this specialty, the first having been a bronze medal by Alessandra Cappellotto in Lugano in 1996. Of her silver medal performance Cantele, who races for the Bigla squad, said, "I did not know what were my feelings in the race. I could not believe the times I heard over the last five kilometers. I was delighted. And, you think this is my first World Cup. The idea came after I won the tricolor jersey. I said to myself "why not think about doing the race in Mendrisio?". "I left the start without a heart rate monitor, no odometer, and I decided to give up on the radio. The information they gave me was from the megaphone but with the roar of people I could not hear anything. Perhaps before today I had it all wrong." 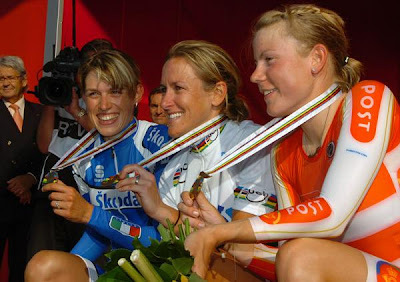 With the gold medal, American Kristin Armstrong closes her career after also winning the Olympic title in Beijing in 2008 and another World Cup 2006 in Salzburg. "It does not matter what year and how many time you are world champion, it is always the best feeling in the world," she said. 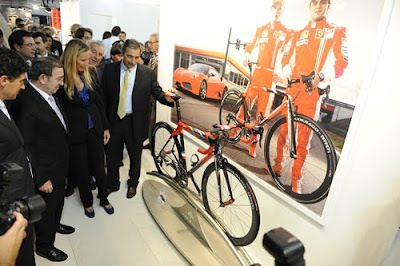 Italy's Environment Minister Stefania Prestigiacomo officially opened the show and is seen above visiting with De Rosa and Colnago. 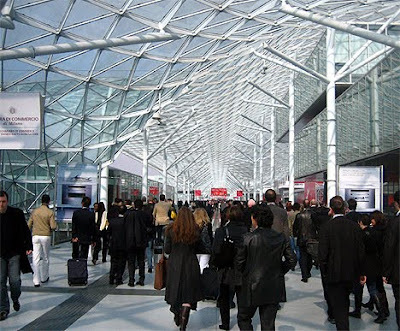 25,000 visitors and also 250 exhibitors. 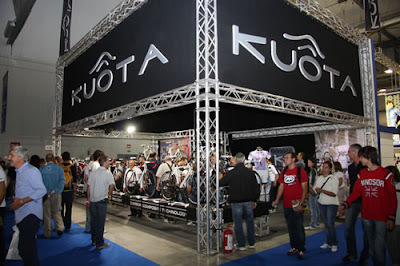 EICMA has announced the dates for 2010: 17 to 20 September. Let's begin with the across the hall fun at the EICMA 67th International Bicycle and Motorcycle Exhibition, held at Fiera Milano in Rho, which took place this past weekend. 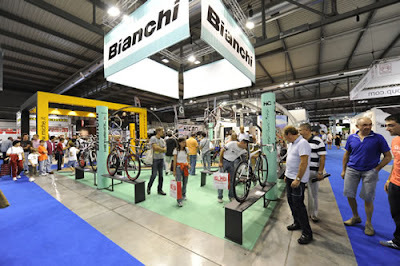 Although the organizers have proclaimed the bicycle show a success, with 45,000 visitors, many of the same visitors have noted that the bicycle portion continues to shrink and is now housed in only one pavilion. Not even all the most significant manufacturers attend anymore. In Part II, coming later today, we'll come back to non-motorized bikes. The Italian road race team was together the first time on a training ride in Mendrisio, Switzerland, led by Ivan Basso and Luca Paolini who often train in this area. Meanwhile, Coach Ballerini was with Marco Pinotti reviewing the TT course. 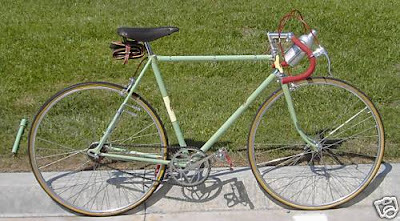 Here is a beautiful bike...just perfect for L'Eroica. 1940 Bianchi Folgorissima with Campagnolo Cambio Corsa completely restored by Cyclart. Currently being sold on ebay (item 150374570453) with a starting amount of $5,750.00. Details of the restoration of the bike: "All the rest of the components on this bike are period correct and in excellent condition. Assembly and refinishing was performed professionally by CyclArt and the bike can be inspected at our showroom in Vista, CA. The paint color is precisely matched the Celeste color of other old Bianchis with original paint. There have been considerable variations of the "official color" over the years. The finish and decals are not only authentically recreated as they were when new, but have been subtly "weathered" to simulate the appearance of a very well cared for original. Small scratches and staining give the character of an aged finish." 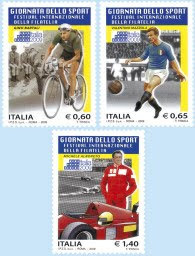 Poste Italiane is issuing three new stamps on October 22nd featuring past champions Gino Bartali, Valentino Mazzola (captain of the legendary Grande Torino soccer team, killed in the Superga air disaster) and Michele Alboreto (racing car driver). Bartali won the Giro d'Italia twice (in 1936 and 1937) and the Tour de France in 1938 and again in 1948 giving him the largest gap between victories in the race. And, of course, there is the rivalry with Coppi that divided Italy. 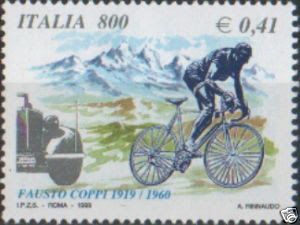 A Fausto Coppi postage stamp was issued by Poste Italiane in 1999. Italian Cycling Journal Story Contest!